As part of the POPSUGAR Insights Content, Commerce, and Culture study, we surveyed over 1,500 women between the ages of 18-44 and asked them to share their level of interest with various ways that brands can connect with them via content and product offerings. First, we asked women to share the ways that they consider to be the most effective for brands to tap into trends and enhance their overall happiness. Perhaps not surprisingly, financial benefits ranked highly, with 52% of women saying that offering coupons is the most popular choice overall. Beyond coupons, women expressed an interest in brands that offer healthy product options (35%), provide free product samples (35%), or sponsor events where free samples are given away (35%), that donate a percentage of my purchase to support a cause (34%), or that offer useful content (33%). In terms of more specific benefits, women said that they were "very interested" in brands that offered the ability to curate a collection or wish list of products (36%), offered exclusive or limited-edition products (32%), offered the ability to solicit feedback from friends or peers about a product (31%), or exclusive in-person events like pop-up shops (30%). 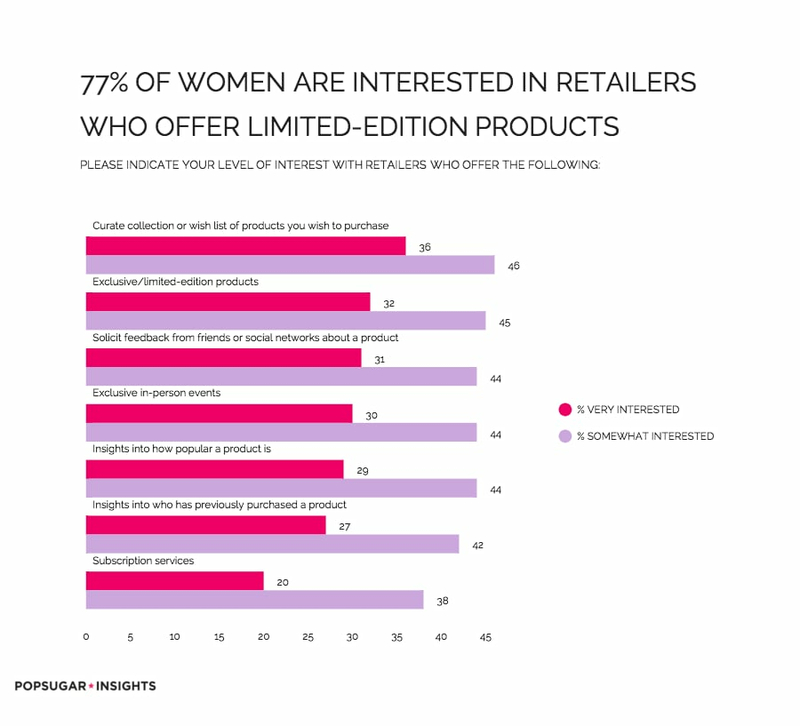 Over 1 in 4 women expressed an interest in products that are designed in partnership with specific designers or influencers (27%) and brands that offer insights into other customers who have previously purchase the product (27%). In terms of overall interest, women preferred brands that offered limited-edition products (77%), the ability to solicit feedback from friends socially (75%), and products designed in partnership with specific designers or influencers (74%).